For me, this is one of the first signs of spring. To you it may just look like a bunch of weeds, but not to me. Some variation of this will be sitting on the corner of my kitchen sink until the end of summer, and a variation of this sat on the corner of my kitchen sink all last spring & summer and the ones before that and the ones before that...you get the point. 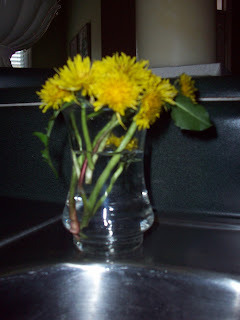 My sweet boys surprise me all spring and summer long by bringing me flowers, and I received my first bouquet of the season today! They are always so proud & excited to give them to me because they know I love flowers. They also have a song that is sometimes sung while presenting the flowers. It goes a little something like this, "Flowers for mommy, flowers for mommy, flowers for mommy"...once again, you get the point. The flowers aren't always the same, as I said earlier there will be different variations. Sometimes I get the purple flowers that grow out of monkey grass, sometimes they are the small white flowers (I'm not sure what they are, but they are another kind of weed), and sometimes I get the purple weed flowers that are growing like crazy right now (at least around here), and last year they started getting brave and picking roses off a rose bush I have in the backyard. Even though I have asked them not to pick the flowers off that bush, it’s hard to get upset when their response is that they just wanted me to have something beautiful :) I'm not sure how many more springs & summers I have of my sweet boys seeing flowers & wanting me to have them, but I'm so excited to see that I'll still be getting them this year! Those are precious memories! So sweet! Awww...what sweet boys you have! I'm sure those mean more than the most expensive flowers would. :) I am sooo.... happy Spring is finally here!